One of my greatest joys in writing The Darcy Saga novels is uncovering tidbits of history. As much as possible, I try to weave the facts into the story in a fun and informative way. For some readers, this is too much like a history lesson! I wish I could apologize or say I won’t add history in the future, but I can do neither. In short, read another author if you are not a fan of history! For those who DO appreciate my research and how it enhances the reality of the Saga, which is as much about the amazing characters as it is about the world they inhabit, then hopefully these small bits of history will be enjoyed. Today I am focusing on four topics: Mountain elevations of England, Charing Cross, the Charles I statue, and the Royal Mews. I grew up in the mountains of California. My hometown, Frazier Park in the Las Padres National Forest, is nestled in a narrow valley at 4,639 feet, literally at the base of Frazier Mountain, which rises to an elevation of 8,017 feet. These mountains, to a native Californian, are considered of a moderate size when compared to Mount Whitney (14,505 feet) or Mount Shasta (14,180 feet), to name just two of the ten California peaks over 14,000 feet. Honestly, mountains rising to majestic heights were so normal to me that it never consciously registered how unusual this may be. Indeed, there are several US states with lofty mountains as high as those in California, but many states with nothing more than rolling hills, flatlands, and modest peaks. As for England, it wasn’t until I began my research into the typography of Derbyshire — specifically for when the Darcys are touring the famed Peaks in In the Arms of Mr. Darcy — that I realized just how low the elevation of the entire island nation. No offense intended to my UK friends and readers, of course, as the countryside of England and Scotland are stunningly gorgeous with or without vaulted elevations. Nevertheless, when I watch the 2005 version of Pride and Prejudice (my favorite version) and it comes to the scene of Lizzy Bennet standing atop Kinder Scout, with the incredible cinematography of the sweeping vistas creating the illusion of an elevation reaching far into the heavens, I am helpless but to giggle just a wee bit! For those who are curious, here are the facts for a bit of comparison. In the whole of the United Kingdom, the highest peak is Ben Nevis in Scotland at 4,409 feet (1344 meters). The highest point in England is Scafell Pike located in the Lake District National Park, in Cumbria, with an elevation of 3,209 feet (978 meters). 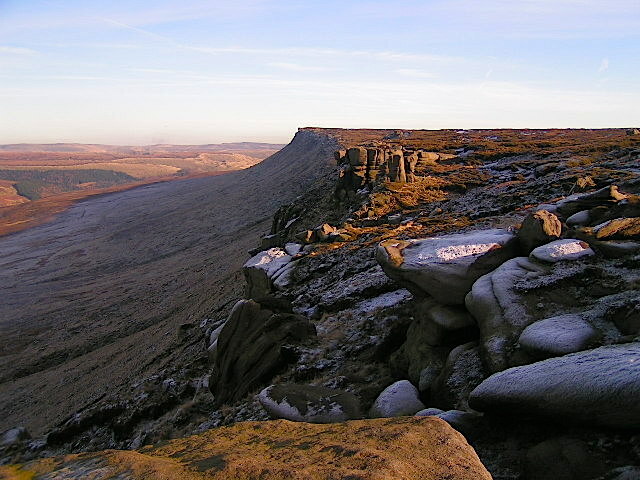 As for the Derbyshire Peaks, the tallest point is the above-noted Kinder Scout, a moorland plateau in the Dark Peak easily walkable from Edale, which tops at a whopping 2,087 feet (636 meters)! A far cry from Mount Whitney in California, USA, but when on top and in clear weather conditions Manchester can be seen as well as the highest mountains of Snowdonia in Wales. That is impressive! The next highest is Bleaklow, the high point at the western side of an extensive gritstone moor reaching a summit of 2,077 feet (633 meters). Traveling south to Hertfordshire, the highest point in the county is on the Ridgeway long distance national path, on the border of Hastoe near Tring, with an above sea level elevation of 804 feet (245 meters). Lizzy’s “bluffs” are an invention of mine, naturally, without a specific location or height in mind. Whatever one imagines, a rise of some 600 or 700 feet is understandably humorous to Mr. Darcy, living as he has in the shadow of the Derbyshire Peaks, but also worthy of a return tease compared to the Himalayas! “Bluffs” in Hertfordshire, Princes Risborough to Tring. In ancient days there was an old village named Charing, located at the present-day central London junction of Strand, Whitehall, and Cockspur Street. Charing was merely a halting-place for travelers midway between the cities of London and Winchester, which were separated by many miles of open fields and wooded land. The name Charing derives from the Old English word “cierring,” referring to the nearby bend in the River Thames. In 1290, Eleanor of Castile, the beloved Queen of Edward I, died near Lincoln in Nottinghamshire. The funeral cortege returning the Queen’s embalmed body to Westminster Abbey took thirteen days, the route later memorialized by a series of twelve elaborate crosses erected by the grieving King at each place her bier rested for the night. The “Eleanor Cross” erected at Charing was reported the most costly of the twelve, and the most elegant. The craftsman in charge of the design and construction was Richard of Crundale, the King’s mason at Westminster. He died in 1293, and the work was continued by Roger of Crundale. The statues on the cross at Charing were the work of Alexander of Abingdon. The material used was Caen stone and the steps were of fine smooth marble. It appears to have been of an octagonal form, and, in an upper stage, ornamented with eight figures. Precisely what the Charing Cross looked like is unknown. The only authentic representations of it which remain are in a crude 1544 charcoal drawing by Wyngaerde, and the 1572 map of “Agas.” The cross stood for three and a half centuries. It was never repaired, the effects of weather and time causing considerable damage until it was finally demolished in 1647 on the orders of Parliament during the English Civil War. Old Charing Cross. From a copy of a very old print published by N. Smith in 1792. In 1865, a not-so-faithful replica of the old Charing Cross was designed by architect E.M. Barry and carved by Thomas Earp of Lambeth. Made from Portland stone, Mansfield stone, and Aberdeen granite, the new Charing Cross was far more ornate than the original. The 70-foot high sculpture was erected a few hundred yards to the east of the original, in front of Charing Cross railway station. 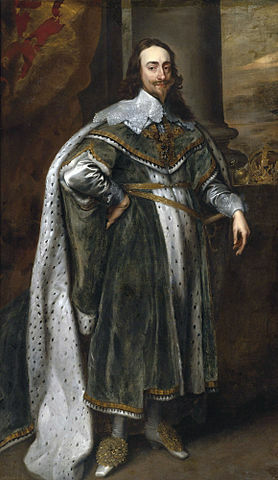 Charles I, son of James VI of Scotland, ruled England, Scotland, and Ireland from 1625 until his execution in 1649. The tale of the English Civil War which led to the monarch’s death sentence for high treason is not the point of this article, however. The events do, on the other hand, play into the story of the massive statue which currently stands in the center of Charing Cross at Trafalgar Square. Charles I is cast in a demi-suit of armor with a scarf tied across his chest. His left hand holds the horse’s reins, while in his right he holds a baton. Completed in 1633 (according to the inscription on the horse’s left forefoot), it was the first Renaissance-style equestrian statue in England. The statue was erected close to the old Charing Cross, just before the serious troubles between the King and Parliament began. It did not stay for long, however. At the breakout of the civil unrest, the statue was removed and stored in the crypt of St. Paul’s. Unpopularity for the hapless monarch after the Parliamentary victory in the English Civil War resulted in an order to have the statue destroyed. A metalsmith named John Rivet bought the bronze statue, with the understanding that he was to break it apart. To this day it is unclear if Rivet was a secret loyalist or a sly businessman, but he defied orders and hid the intact statue instead. Over the subsequent years, he produced a few broken pieces of brass as “proof” of following orders and fashioned a host of items (knives, forks, handles, and the like) that he claimed to be made from the infamous statue’s brass. The objects were extremely sought after by those not fond of the doomed King, as well as those loyalists who desired them as a relic. Whatever Rivet’s impetus, it could not have been easy to hide such a huge object, although his profits surely made it worth his efforts! After the Restoration in 1660, when Charles II (reign 1660–1685) assumed the throne of England, the statue was discovered by Jerome Weston, 2nd Earl of Portland. Following a complaint to the House of Lords, it was decreed: “That the said John Rivett shall permit and suffer the Sheriff of London to serve a replevin* upon the said Statue and Horse of Brass, that are now in his Custody.” The statue was purchased by the King and in 1675 was returned to Charing Cross. A new pedestal of Portland stone was made by royal stonemason Joshua Marshall with a carved coat of arms in front. *NOTE: Replevin (sometimes called revendication) is a lawsuit that enables a person to get back personal property taken wrongfully or unlawfully. And kings so kill’d rise conquerors again. The “martyrdom” referred to in the poem is commemorated each year on January 30 (the date of Charles I’s execution) in a wreath-laying ceremony. In the plural, MEWS refer to a building containing multiple cages for hunting hawks and falcons to be kept safe during the moulting (or mew) period of shedding feathers. In a broader sense, and over time, the word evolved into a place where hunting raptors (and other birds) were housed and cared for. The sport of falconry has existed for millennia, particularly amongst the upper classes and aristocracy, with specific housing for the precious raptors a necessity and thus found on many country estates. In 1377, King Richard II established the King’s Mews located near Charing Cross at the end of the Strand in London. The separate, remote location was chosen due to the noise and mess of the birds, and the wide open spaces surrounding the mews were perfect for training the birds and releasing for hunting. Henry VII (reign 1485-1509) was a passionate falconer, the King’s Mews a busy place during his lifetime, as well as during the rule of Henry VIII. The building reportedly burnt in 1534 (or 1537, according to some historians) and was rebuilt, however, the purpose changed. Rather than a building to keep hawks, it was redesigned as a stable for the royal horses. The name, firmly established after nearly two centuries, remained intact despite the new function. It was rebuilt again in 1732 to the designs of William Kent. It was an impressive classical building, and there was an open space in front of it which ranked among the larger ones in central London at a time when the Royal Parks were on the fringes of the city and the gardens of London’s squares were open only to the residents of the surrounding houses. In the 1760s, George III moved some of his horses and carriages to the grounds of Buckingham House, which he had acquired in 1762. 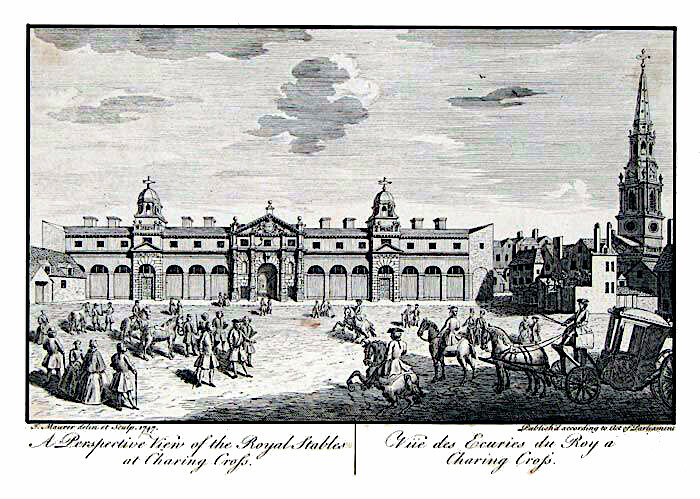 The King commissioned architect Sir William Chambers to create a riding school at Buckingham House, but the main royal stables housing the ceremonial coaches and their horses remained at the Charing Cross location. However, by the end of the century, most of the surrounding buildings on the Hedge Lane and Charing Cross frontages were leased out to private persons, and William Kent’s impressive building gradually lost its original function. Used for horses and carriages still, it also served for the storage of public records and, for a time, as a menagerie. 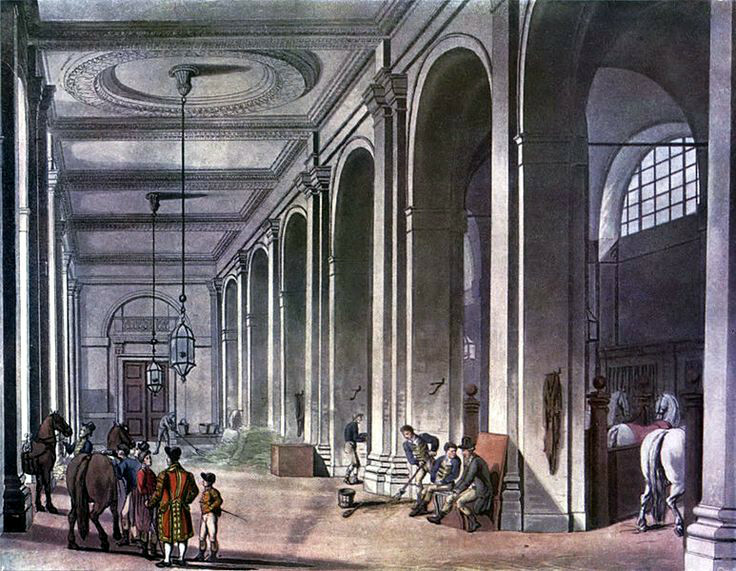 Despite the waning importance, it was not until the reign of George IV (1820-30) that the royal stables transferred completely to Buckingham, which was being transformed into a Palace by famed architect John Nash. He continued his work by building grand stables around the riding school and a Doric-style arch, surmounted by a clock tower, leading into the quadrangle of the new Royal Mews. This was completed in 1825, again noting that the term “mews” was maintained. At roughly the same time as the building of the new mews, the King’s Mews at Charing Cross was opened to the viewing public. Tragically, the decision was made to demolish the building. John Nash was again enlisted, building Trafalgar Square on the site between 1827 and 1835, with the National Gallery opening in 1838. Not a shred of the old mews remain. T. H. Shepherd engraving showing the appearance of Kent’s building just prior to its demolition in 1830.